When we saw this cool apple cupcake recipe we just knew that we had to share it! Hey guys, it’s Ro welcome to another Nerdy Nummies. I got so many requests from you guys to make something from Descendants 2- and not only are red apples in the logo of descendants But the second movie opened with the musical “Ways to be wicked” and there was red apples Everywhere. Every scene, every shot and I thought that is perfect. So today we are gonna be making a descendant themed red apple cupcake Let’s get started. The things you will need to make this delicious. Apple cupcake recipe will be; 1/4 cup buttermilk, 2 eggs, 3/4 cup of butter, 1 cup of packed brown sugar, 1 and 1/2 cups of all-purpose flour, 1 apple, 1 tablespoon of lemon juice, 1 teaspoon of vanilla extract, 1/8 teaspoon of nutmeg, 3/4 teaspoon of cinnamon, 1/2 a teaspoon of salt, 1 and 1/2 teaspoons of baking powder, and and 1/2 a teaspoon of baking soda now, let’s put it all together! First up to making our cupcakes is whisking together our dry ingredients. In front of me I have a large bowl. Pour in your flour, salt, the baking powder, baking soda, cinnamon, and nutmeg. Mmmm. These spices together! Then whisk together until well combined and set off to the side. Yeah. Next step peel and shred your Apple. Start by peeling, and I’m just gonna hand peel it. Get off of there, get all the skin off. To grate your Apple, we’re grating it just like cheese We’re gonna use the large size one, the large grate. Just keep grating, but stop at the core. You don’t want the, you don’t want the core. It doesn’t taste very good. Whoo. Here we go Now place all your shredded Apple back into the bowl, and toss with a little bit of lemon juice so that the apple won’t brown. That looks and smells good now set it off to the side. Then in a large bowl mix together your wet ingredients, and the brown sugar. We have also melted the butter. So pour in the butter. Mmmm. Brown sugar, buttermilk, vanilla extract and two eggs, you’re gonna be adding the whole egg. Then whisk together till well combined Everything is ready to go. Now add all of the shredded apples and the wet mixture into the dry. Just pour it all in. Then using a spatula mix together until you can’t see any more dry ingredients. Our apple cupcake batter is ready time to scoop into our cupcake tray. In front of me I have a cupcake tray lined with a bunch of paper liners. Using an ice cream scoop Get some batter and you’re gonna want to fill each cavity Two-thirds full. Cupcakes are ready to bake heat your oven to 350 degrees and bake for 18 minutes. While the cupcakes are baking, we’re going to make some decorations. Each apple cupcake gets one fondant leaf, so in front of me I have the marshmallow fondant that I’ve dyed green. Place it on top of a piece of wax paper and place this down So that it won’t stick to the surface, and you want to roll it out. I’m using a fondant roller They don’t have handles. So you just … I’ve rolled the fondant out to be about a quarter-inch thick then using a small cookie cutter. This one is shaped like a little mini football, cutout between 12 to 16 leaves However many cupcakes you got. Now using a fondant tool I’m gonna make some details on the leaf press down and make a line all the way down the middle of the leaf to make a vein and Little ones on the side and then do this to the rest of your leaves After the cupcakes have baked give them plenty of time to cool then time to frost and decorate, my favorite part. This is really neat so over here I have the vanilla buttercream frosting in a piping bag with a number 1A tip at the end It’s just a big circle tip at the end for a little bit more control. You’re gonna hover over your cupcake and apply pressure We’re gonna make a little frosting dome And just hold it in the same place right after you’ve iced it Gently roll it in some red sanding sugar. Our cupcakes are frosted and dipped time for our final decoration step adding our little details our fondant leaves to the top of each cupcake and these cute little Chocolates to look like an Apple stem to make the cute little apple stem I’m using something called a chocolate cigarette and for anyone who isn’t familiar It’s just tempered rolled Chocolate and they come in about this size and I’ve just broken them off into little pieces about an inch long so that they look like little stems There you have it. Our homemade apple cupcakes inspired by Descendants. 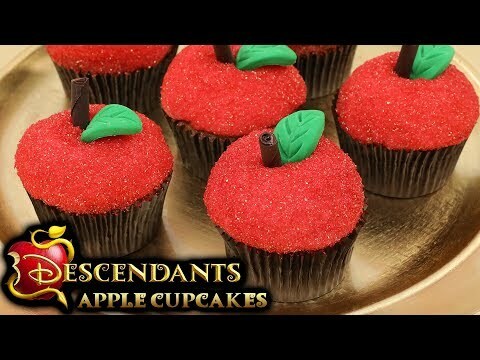 It’s so cute because the descendant logo is a big red apple and in the second movie they have tons of red apples Everywhere this apple cupcake recipe is delicious I’m gonna be posting pictures and the recipe on RosannaPansino.com, Instagram, Facebook, and Twitter so you can check it out there. And if you guys make these cupcakes, they’re so cute Please take a picture and send it to me. I love seeing your baking creations It just makes me happy. It makes my day and if you have any other ideas for any other Nerdy Nummies, please Let me know leave me a comment down below and I will do my best to make it happen. Alright Thanks again you guys, bye-bye. I did weightlifting today and pushup so I’m going for it Mmm has a hint of apple pie. It’s so good .